Michael Scheurer is a hobbiest songwriter/composer & Audio Engineer. Specialising in writing, arranging, recording & mixing original music. Michael is a keen guitar player, also dabbling in bass and keyboard. Being a Macintosh consultant all music is recorded/produced using Apple Logic Pro software. Why not let us write and produce the music for your latest multimedia project or ad campaign. 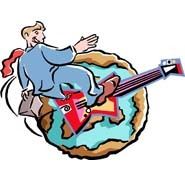 OceanWerks is an internet collaboration band, headed by Michael Scheurer and Morty Webb. We write and record entirely via the internet. The founding & current members reside in Seattle & Florida, USA and Melbourne, Australia. Blues At Chinta was written & recorded over a 2 year period at Michael's home studio. We were lucky enough to secure the talents of Franz Scheurer, who added his haunting Cornet to various tracks throughout the CD. Steve "Refin" Spayde who took over lead guitar duties on Walk The Walk, recorded at his studio in Florida. 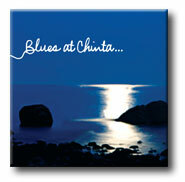 Blues At Chinta is currently only available as a download, please contact Michael for more details on how to purchase your copy.